MTN Group is a South Africa-based category-king multinational mobile telecommunications company with presence in many African, Asian and European nations. It is a leading Africa brand, serving approximately 221.3 million people in 22 countries. Its vision is to deliver a bold, new digital world to its customers. MTN Nigeria is the leading mobile operator in Nigeria with approximately 54.5 million subscribers. According to reports, about 30% of MTN Group’s revenue comes from its Nigerian operation where it holds at least 35% of the market share. For financials of MTN Nigeria, I have analyzed them here: the company (i.e. MTN Nigeria) made either N81.4 billion or N248.3 billion in Q1 2018 depending if you believe the Group financial report published in the Johannesburg Stock Exchange or another report hosted by MTN. What is the Value of MTN Nigeria? As MTN Nigeria plans to list on the Nigerian Stock Exchange, investors would model how much the company is worth. I did try using available numbers in the past here. Option A: I concluded that MTN Nigeria would be worth $4 billion (30% of the company would be $1.2 billion). So, if MTN Nigeria should sell 30% of its value and MTN Ghana sells 38% and both generate $1 billion, I would see that as a discount. Let us assume that MTN Ghana brings in $300 million while MTN commands $700 million. Using that we can say that 30% of MTN Nigeria is $700 million. (Bloomberg noted $500 million for 30% though that was not the most current number on this). But from 9Mobile sale price (not certain until it is done), I had modelled 30% of MTN Nigeria to command $1.2 billion. So, if they are going for $700 million, it means MTN Nigeria is coming at a big discount. If that is the case, investors would go for it. 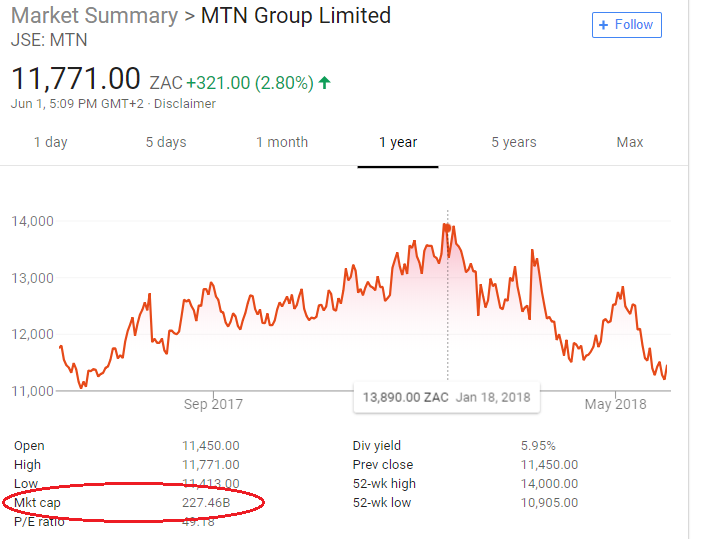 Option B: I used the market cap of MTN Group to arrive at the value of MTN Nigeria (MTN Group market value has lost value since the piece was published but it is insignificant to change the analysis). About 33% of MTN Group revenue comes from Nigeria. Also, Nigeria commands more than 25% of its total subscriber base. Largely, Nigeria is perhaps the most profitable market for MTN Group. If you take the subscriber base alone, you can put MTN Nigeria at a market cap of $4.25 billion (25% of the $17 billion). By the time taxes are taken, the value of MTN Nigeria can down as $4 billion. This piece from Reuters provides solid numbers on the value of MTN Nigeria: $5.23 billion. MTN plans to list its Nigerian unit worth $5.23 billion by July in a debut IPO on the Lagos bourse and will raise fresh funds to reduce debt, according to pre-IPO presentation seen by Reuters. This is the most authentic data we can use since MTN Ghana had indeed filed the paperwork with the regulators. It is selling 35% of the business for $745 million. Certainly, the old reports are wrong since MTN cannot be seeking $1 billion from both Nigeria and Ghana, and Ghana is contributing already $745 million. Through the Initial Public Offer, MTN Ghana seeks to raise about of GHS3.48 billion (over US$745 million) with each share sold at GHp75. The offer is expected to end on July 31 and possibly list on the Ghana Stock Exchange on September 5, 2018. MTN Ghana on the 20th of April, 2018, received approval from regulatory bodies including the Securities and Exchange Commission (SEC), Ghana Stock Exchange (GSE) and the Ghana Investment Promotion Council (GIPC) to proceed with the 35 per cent IPO which forms part of MTN’s 4G LTE license requirement in which the company had to sell 35% of its shares to Ghanaians by June 2018. MTN Ghana has 17.8 million subscribers and commands a market share of 47.6%. MTN Nigeria has 54.5 million subscribers with a market share above 35%. Neglecting the market positioning and focusing on the subscriber base, 35% of MTN Nigeria should give 3.06x of the $745 million from Ghana (i.e. $2.3 billion). With this number, MTN Nigeria would be worth $6.57 billion. But since MTN Nigeria does not have the same market positioning as it has in Ghana (48% vs 35% market share), we would drop $1 billion from the number. That brings the market value of MTN Nigeria to be $5.57 billion. Post-IPO, that would give it about 13% of the total value of the Nigerian Stock Exchange, depending on the exchange rate you use.